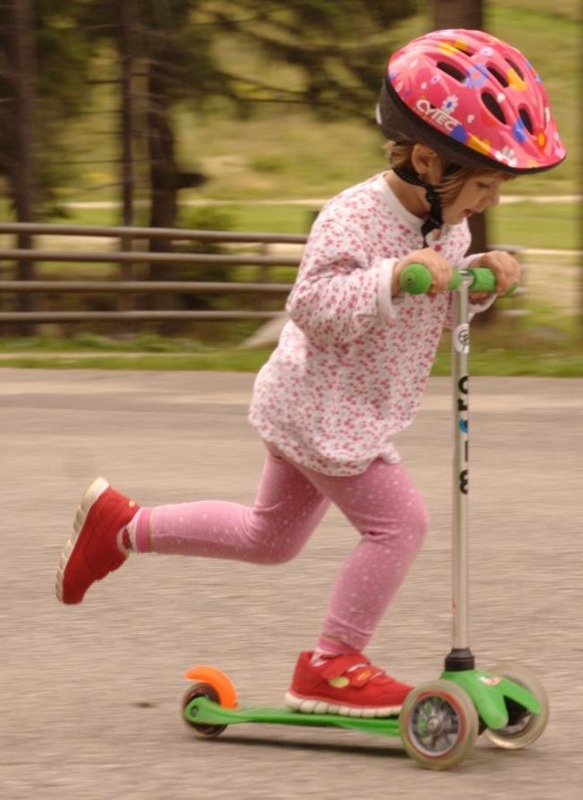 Which Micro Scooter Is Right For Your Child? It is pretty much a given fact that the range of Micro Scooters from Micro Kickboard are some of the most popular and well-built kick scooters out there. They are award winners, best-sellers and there is no doubt that Micro Kickboard produces some of the best kids kick scooters in the world. So many young kids are riding them these days that they must be giving Razor a real run for their money in terms of kick scooter sales. However, there is one big difference with these Micro Scooter models and that is that they all have the 2 wheels at the front design. We also look at some of the Micro Scooters that are designed for older and taller kids, teens and adults at the bottom of the page as well as the classic toddler models. Micro Kickboard also manufactures regular 2 wheeled scooters. but here we will only concentrate on the popular 3 wheeled design. They have two at the front and two at the back. the two rear wheels are mounted next to each other so that they provide maximum stability but as they are next to each other they just look like one big, wide wheel (see the pictures below). One of the main reasons that parents like the Micro Scooters so much is that they are completely safe. Their intelligent Swiss design with two front wheels instead of 1 and the double rear wheel (pictured below) provides ultimate stability and therefore safety. These kick scooters will stand up on their own, are impossible to over-steer and will never lose balance, so your kids are unlikely to ever wobble and fall off these top kick scooters. Micro Scooters are built with extremely high-quality materials that will last a lifetime if looked after. Of course, they are more expensive than most of the other regular kick scooter Brands but in the case of Micro Scooters, you definitely get what you pay for. It will be hard to find a parent that is not happy with any Micro Scooter that they have bought, including me! So welcome to my run through the various models of Micro Scooter and some advice on which Micro kick scooter might be the right one for your child. The Mini Micro Scooter is another perennial classic from Micro Kickboard. It is the baby sibling of the Maxi Micro Scooter and is an incredibly popular product. The Mini Micro is best for toddlers and small children between the ages of 3 to 5, depending on their height. It can withstand a weight of 44 lbs and is recommended for kids between 98 cm and 110 cm tall. I have known kids as old as 8 rides around on the Mini Micro without a problem. It is very strong and will last a lifetime. It is extremely lightweight at 3.3 lbs so can easily be carried by a child or parent when they get too tired from scooting on it. I have seen mum's carrying a child in one arm and the mini micro scooter in the other without any problem. The handlebar stem can be removed for easy storage but it will fit in the trunk of a car with the handlebar in place. There is a small fender-style rear brake which is easy to operate. The handlebar stem is fixed at 60cm and not adjustable, but this is an appropriate height for most kids between 3-5 years old. Here is a discount link to the new range of Micro Mini Deluxe Scooters which are an upgrade on the Classic Micro Mini. You can find all the available colors if you follow this link. If you want to read about the Mini Micro in more detail, head on over to our Mini Micro Kick Scooter Review. The Mini Micro (or Micro Mini as they sometimes call it) is not now alone - it has cousins! Here are the clever variations on this classic model. 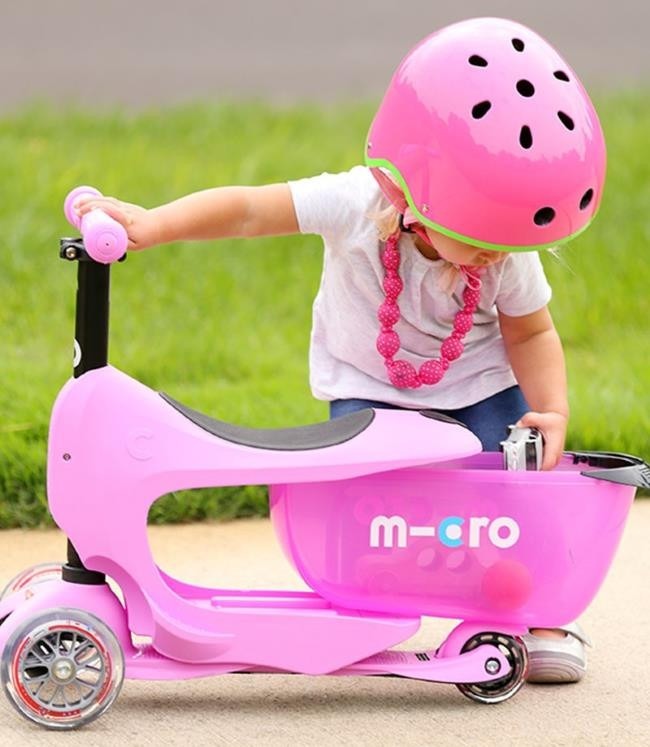 The Micro Mini 3-in-1 toddlers kick scooter is so-called because it has 3 main modes of operation. It is a clever variation on the Mini Micro Model above but adapted for younger children. 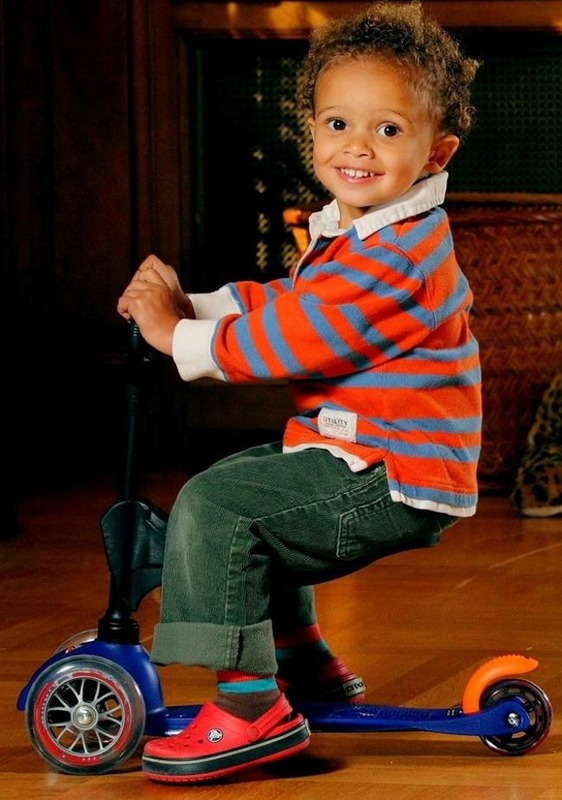 As such this ride-on scooter/kick scooter is suitable for ages 1 to 5 years and will grow with your child. Rest assured that the scooter is built with very high quality, virtually un-breakable materials and should last the full 5 years with no problem. All the pieces of the kit that you need are included, the seat, the special oval-shaped ride-on grab-handle, and the regular handlebar stem. This option may seem expensive for a 1-year-old, but if you spread the cost over the 5 years that it will last it becomes incredibly cheap! 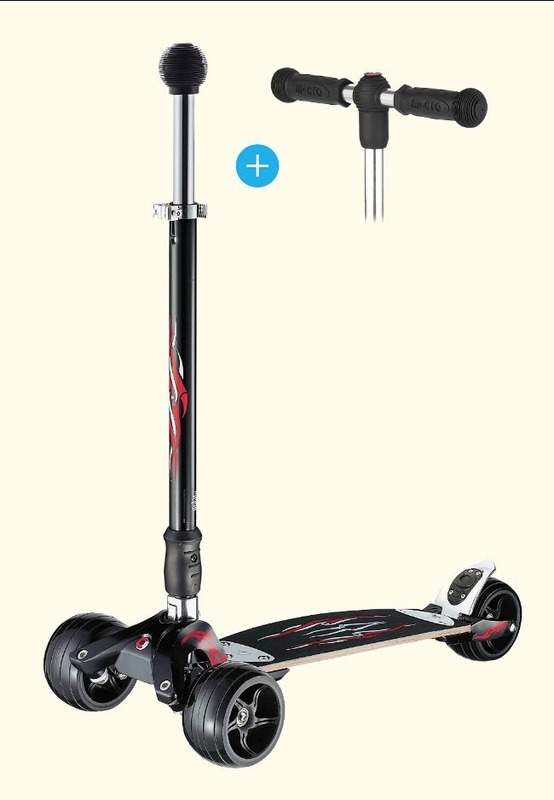 Ultimately, the Micro 3-in-1 turns into a full-fledged Micro Mini Kick Scooter and is exactly the same as that model, with its fixed height handlebar stem. Next up is another variation on the good ol' Micro Mini and another clever twist on an old classic. The Mini 2 Go toddlers kick scooter is the latest in the Micro Kickboard family for ages 18 months to 5 years old. This is a different take on the Mini Micro model we have already discussed and the floor-board (kickboard) is exactly the same as the Mini Micro. This time it has an adjustable handlebar stem so you don't need to switch it out like the Micro Mini. It also has a neat new-style seat with a trunk inside so your kids can carry around their favorite stuff wherever they go! The Mini2Go retains all of the benefits of the Micro Mini but with added convenience and fun. The single handlebar stem is fully adjustable this time and the seat-trunk can be removed to convert it from a ride-on toy to a stand-on kick scooter. The Mini-2-Go really is a great addition to the range and again, will last the 5 years it is designed to be used for without any problems. This tough little toy will go on and on, much like your little ones themselves! As mentioned, the Maxi Micro Kick Scooter is the older sibling of the Mini Micro. It is similar in appearance except it is designed for older, taller and heavier kids and recommended for children aged 6 -12 years. To provide for extra stability the Maxi micro has 2 wheels at the back which are mounted right next to each other. The Maxi Micro can be enjoyed by your child for an extended period of time because the handlebar stem can be adjusted to cater for growth. My 12-year-old is tall and the Maxi Micro is still not too small for him. The handlebar stem can be adjusted in height from 67 cm at the low end to 93 cm at the maximum. This means that the design is good for kids between the heights of 110 cm - 152 cm. If you are concerned that a 2-wheeled kick scooter will result in too many bumps and bruises, even for an older child, then this is the model for you. The Maxi Micro can take a weight of 100 lbs because it's so strong, this makes it ideal for heavier kids who may lack confidence on a 2-wheeled scooter as well. The Maxi Micro Kick Scooter does not fold like the models below, and this could be a problem for storage. However, this issue did not happen to be a problem for me personally, as the Maxi Micro could fit in my trunk sideways with no problem. If you want to read about the Maxi Micro in more detail, head on over to our Maxi Micro Kick Scooter Review. I cannot recommend this Maxi Micro kick scooter enough, especially if your child has any qualms about getting on a 2-wheeled scooter. But wait! 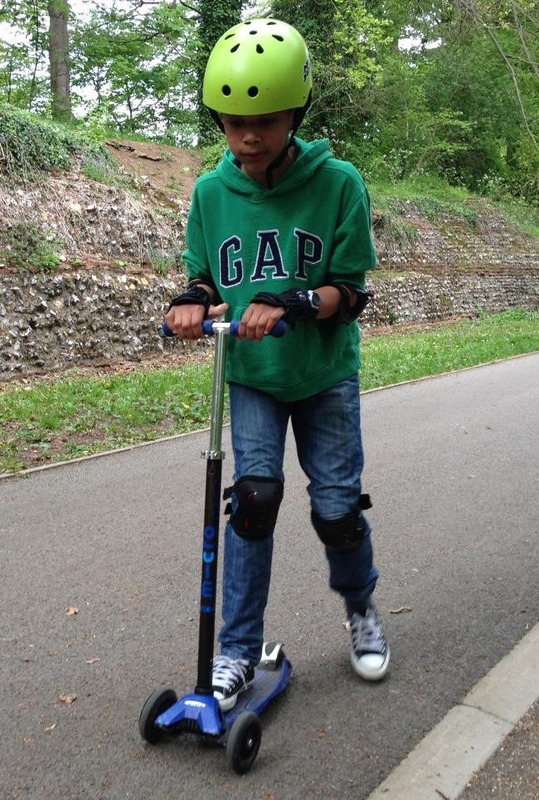 Here we have the latest addition to the Micro Maxi range of kick scooters for older kids, teens or adults. As with the Mini2Go, Micro Kickboard has put a clever twist on a popular previous model and this can be considered an upgrade to the original Maxi Micro Scooter. If there is one problem with the maxi micro, it is that the handlebar stem could not be folded. This Monster kick scooter is taller so the folding mechanism makes it really convenient to store away or throw in the trunk. The Monster Micro kick includes a folding joint near to the base of the handlebar stem to make it simple to fold. It includes both T-bar AND Joystick styles of the handlebar to create a real street-surfing feel. You can see from the picture above that the wide track "monster" wheels offer better balance and greater stability for those wanting to create long curves and build up some speed on the streets. The flex deck is made of wood and fiberglass and is designed to absorb bumps and guarantee a smooth ride. The Monster fat tires can even travel easily on grass or rough terrain. When you take the Monster Kickboard out of the box, it's in "Joystick mode." The T-bar is included in the box along with the instruction manual. Switching from one handlebar style over to the other is easy due to the clip on the stem. There is a more adult version of the folding micro above and that is this Compact Interchangeable Scooter. The Kickboard Compact is the next model up from the Maxi and is perfect for young teens and smaller adults. It uses the same axle style steering as the Mini and Maxi so you lean to steer. The Compact has a slightly shorter aluminum deck which makes it easier for teens and young adults to handle at speed. The handlebar can be folded-down which makes it highly portable and convenient. The recommended rider weight capacity is 170 - 220 lbs, although Micro Kickboard highly recommend that the heavier riders do not use the Compact model. The cool feature of the Compact is the interchangeable T-bar handlebar which can be changed out for a Joystick. Using the Joystick creates a more skateboarding or longboarding feel to the ride. Both types of handlebar are in the box and when it arrives it is already in the Joystick mode. Switching out the handlebars is easily done with a clip on the stem. Best for teens and taller or heavier kids, the Compact micro scooter is a winner. All these 3-wheeled kick scooters are excellent in design and construction. I hope that this guide will help you answer the question "Which Micro Scooter Should I Buy for My Child?". If you have any more questions or want to look at our reviews of the best kick scooters for adults and kids then feel free to leave a comment below or browse this site! Micro Kick Scooters are so good they get the top rating! outstanding post. I like the video of the MIcro founder much. I never thought that 3-wheeled scooters would be this good. It's also good to know that Micro manufactures kick scooters for all ages. What I don't understand how the joystick handle works. How are you supposed to steer with no handlebar? I'm just curious. Hi Walter, that's a great question. The micro scooters with the single Joystick stem steer by leaning into the stem in the same way you steer a micro scooter with a regular handlebar stem. The 2 front wheels are connected in such a way that they don't actually turn but are designed to steer by leaning instead.